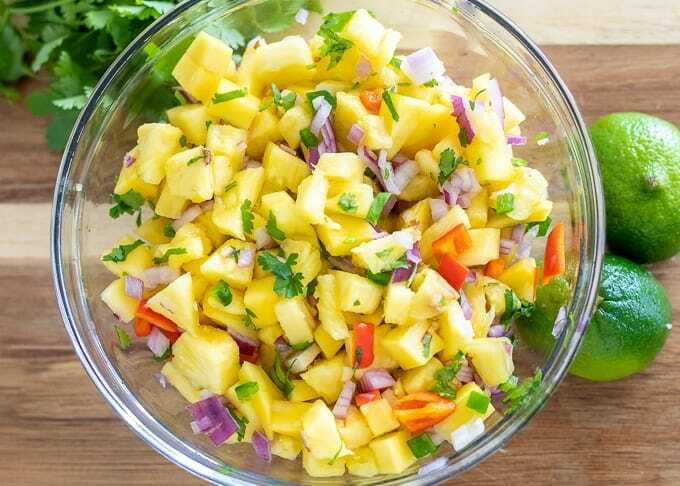 This Pineapple Mango Salsa is a sweet and spicy fresh fruit salsa that pairs perfectly with fish, chicken, or salty chips! One of my most cherished gifts is the recipe box I received at my bridal shower over a decade ago. It is filled with hand written recipes that my friends and family thought I may enjoy. And one of the best recipes in that recipe box was from my mom’s friend for this Pineapple Mango Salsa. Fresh pineapple is the perfect base for a delicious fresh fruit salsa. However, when you add mango to the mix, you have the base for a perfect bright and fresh fruit salsa. This fresh Pineapple Mango Salsa is just the right combination of sweet, salty, acidic, spicy, and fresh flavors, and pairs incredibly well with fish, chicken or even just a gold old corn chip. Finely mince red onions and sweet bell pepper. Remove seeds and ribs from inside jalapeno. Mince jalapeno into very small pieces. Mix together all ingredients with salt. It is best to let the flavors in this Pineapple Mango Salsa develop for at least 30 minutes before serving. This fresh Pineapple Salsa will last for 3-4 days in a covered container, stored in the refrigerator. The recipe I received in that cherished recipe box, states to serve this Fruit Salsa with corn chips in bold letters. And friends, there is certainly something magical to the salty combination of corn chips with this sweet fruit salsa. However, this salsa is good served a variety of ways. Be sure to dice pineapple and mango into small pieces to make the Pineapple Salsa easier to scoop up with chips. To control the heat of this fruit salsa, be sure to remove seeds and ribs from jalapeno. Wear plastic gloves while chopping the jalapeno or wash your hands well after handling to protect your skin and eyes from the juice from the pepper. A pro tip to juicing limes is to microwave for 30 seconds, then roll on the counter. Use a juicer or a hand held kitchen mixer attachment to juice the lime. 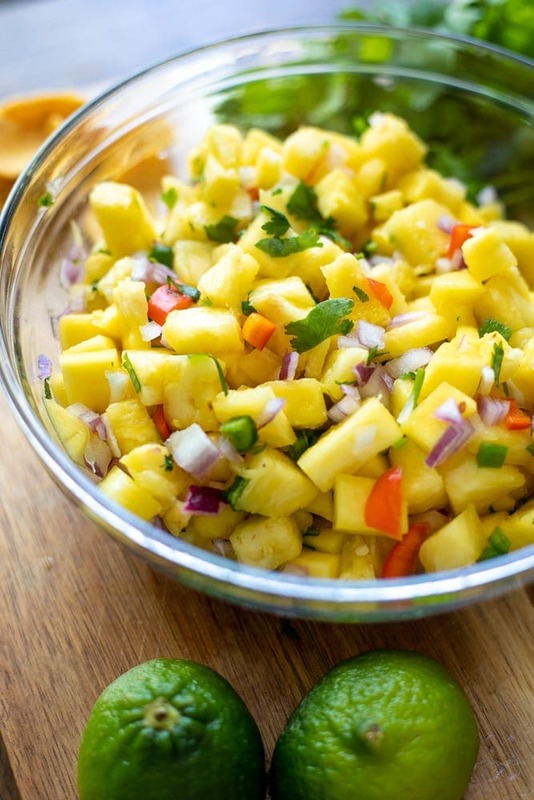 The salt is a must to bring out all the flavors in this pineapple mango salsa. Dice the pineapple and mango into 1/2 inch chunks. Toss with the onion, jalapeno, pepper, and cilantro. Squeeze the fresh lime juice over the salsa and sprinkle with salt. Toss to combine. Refrigerate for at least 30 minutes before serving for best flavor. If you are NOT serving with salty chips, you may want to increase the salt to 1 teaspoon for taste. I’m totally okay with calling for the Fritos. I have a dip on my blog with them. Sometimes calling for them is the right thing to do. Ha ha. I love this recipe and hearing where it came from. What a lovely gift. I totally call them Fritos and I love how you keep a recipe box, with handwritten recipes that have personal meaning. It is a great keepsake Amy! Have you tried the sprouted corn? love those chips! and i think they are healthy! and i want this salsa! Pineapplle and mango are great together, this salsa looks fantastic! Thanks Marye–I agree pineapple and mango are a great combo! Summer is the best time for this salsa! Looks vibrant and very appetizing! Wish I had some of this now! I am guilty of eating this salsa with just a spoon many times! I’ve never tried a salsa with pineapple before, but it looks so good, I’m sure that will change! I hope you give this a try Jeanine. Pinapple is a great addition to salsa! I don’t want to imagine life without corn chips… I just don’t. 😛 Love this recipe, dear friend! So colorful and fresh!